In many property restoration situations, content restoring is one of the critical parts of the process. However, not every restoration company or general contractor offers it as a service. Most include mitigation, board-ups, and cleaning, or alternatively just reconstruction, which are also critical parts. 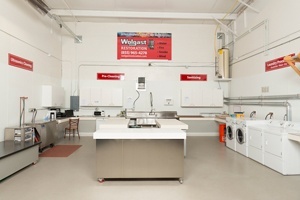 For those companies that don’t offer the content processing service, they can outsource it to companies like Wolgast Restoration to remove the items, clean and deodorize them, and store them via an inventory system in a large, climate controlled, secure and dry location. Oftentimes, the bulk of the heartache of a disaster isn’t the loss of the structure, but more so the loss of keepsakes and other valuable items. Using a content processing crew that is trained by IICRC can help to clean and deodorize a wide range of items that may otherwise be mistaken as ruined. We surprise our clients quite often with the rare items that we can restore to pre-disaster condition. For instance, one of our customers had an antler mount on a cream colored base that was stained with smoke and soot and thought to be a total loss, but through our IICRC training and equipment, we were able to restore the base and the antlers to their pre-disaster condition, much to the client’s surprise. Additionally, we were able to salvage a large part of a different customer’s massive baseball collection after a fire in his home. 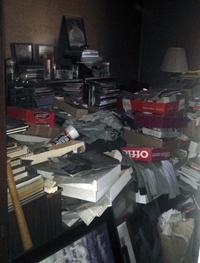 He not only had over 200,000 baseball cards, but also newspaper clippings, books and other valuable memorabilia. Needless-to-say, the customer was concerned about the inventory and keeping track of the items that were most valuable, regardless of salvaging or not. We were able to assess everything, salvage a large portion and satisfactorily establish his comfort with our system to keep his collection intact for his review. In addition to sanitizing, we keep inventory of all items in our care. We use a barcode tracking system to inventory and process contents, so at any time during our care, we know what items have been cleaned, what items still need to be cleaned, and where an item is in our warehouse (which vault). 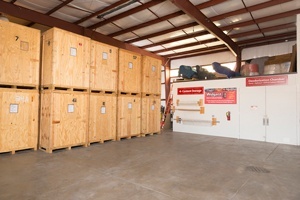 Additionally, we have adequate storage/vaults to take on a loss of any size and we carefully pack-up all items for storage then keep them secure until it’s time to return to their owner. Adjusters, restoration companies, general contractors or building owners can contact us at 855-WOLGAST, for our content processing services. We can also be contacted at that same number 24-hours a day to provide restoration services, mitigation through reconstruction, if necessary.